Except for the Memorial Bench, a commission, all the following pieces were designed and built as portable show pieces of innovative design and expert execution. One design led to another. The Maple Padouk table begat the Walking Table which then led to Walking Together and Tutu Table. And there are 20 more variations floating around my mind, just waiting for the spare time or the commission to build them. That's where you come in. Maple Padouk Table 16"x20"x30" - 2nd prize winner in woodworking at the 2006 Marin County Fair, inspired by Florentine designs and figure drawing. 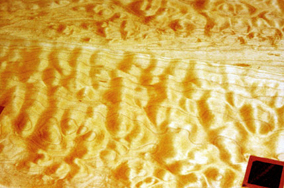 The legs are Padouk, provided by sustainable West African forests, the quilted maple top is extraordinary and rare. SOLD - a similar design is available on a custom basis. 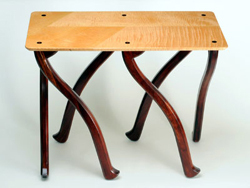 The "Walking Table," winner of Honorable Mention at the 2006 Marin County Fair, is a spin-off from the first table, with a never-done-before, to my knowledge, innovative leg design. Another angle on "Walking Table." Curly maple and Padouk. Oil finish. 20"x20"x30"H. One table has been sold. Memorial Bench, curly maple, 15"Hx12"W28"L,. A child's size bench for the siblings of an infant who died at 15 months. 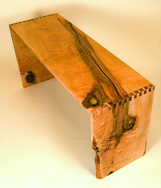 "Katrina Bench, Broken Dreams and Renewal," whose wood, a unique plank of figured maple with splits and knot holes, was repaired with epoxy, sanded smooth and assembled with dovetail joints. SOLD. Other benches can be ordered for about $1600. I'm in the process of building another twice the size out of Big Leaf Western Curly Maple: 1-1/2"Thick X 22"Deep X 30"High X 60" Long with hand cut dovetails. 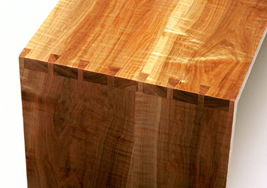 "Tutu Table", winner of a Merit award at the Marin County Fair 2007 and Honorable Mention at the California State Fair 2007, inspired by the SF Ballet and Degas, built of flame birch, Spanish cedar and Padouk; inspired by the San Francisco Ballet. The top will turn a deep honey brown over time, the legs a red brown. I rearranged the grain on the top for visual interest and for a the challenge of it. SOLD Mar 10, 2013. Available on a custom basis for $2600. To order any of these pieces, or to discuss variations, or custom work, please use the email address or telephone number below.